In business, the “win-win” opportunity is sought after like gold in the mountains and is as common as rocks. * Purchases, marketing agreements, and employee contracts are always structured for two parties to benefit. Figure 1 depicts these relationships. But while the win-win is common, the win-win-win is less common. Three way trades in sports come to mind. Other examples can be seen in Figure 2. One of the more amazing things is the win-win-win-win. Google generated $1.66 billion in revenue from this model in the second quarter of 2008. This represents 31% of Google’s total revenues. Over $5 billion in annual revenue. If it has just a 10% profit margin due to payments to Content Providers, that is still $500 million in annual profits. And I’m guessing that in most cases advertisers pay Google early while content publishers receive funds late due to minimum payouts. 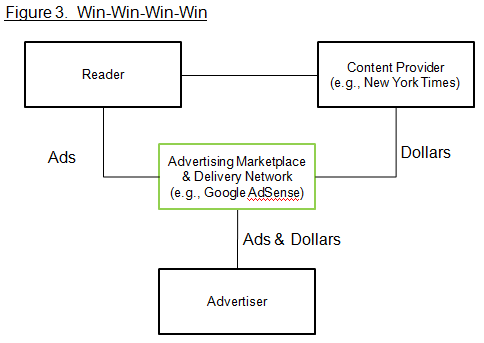 Figure 3 depicts the Google AdSense win-win-win-win. I’ve included the flow of dollars and advertisements for clarity. 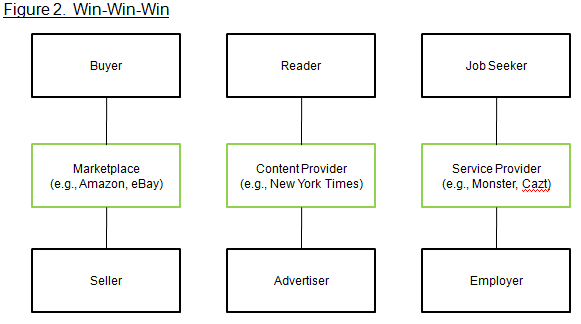 In advertising, the win-win-win-win works where (a) knowledge about what a user will respond to improves targeting; and, (b) many options are available for what can be shown the user. Amazon leverages the model with its affiliate program. It uses knowledge about what consumers bought to show relevant products (the 4 parties are Affiliates, Amazon, Merchants and Customers). LinkedIN is now trying the model by using knowledge about where people work to show relevant job postings and advertisements (the 4 parties are Affiliates, LinkedIN, Employers/Advertisers, and Job Seekers/Professionals). Looking forwards, I’m sure we’ll see this model influence advertising on our TV and Cell Phone. Its interesting to think about what knowledge about a user will be most important. For TV advertising, is it what products your friends on Facebook just bought? For the Cell Phone, is it where you are geographically? What do you think is the most valuable knowledge for advertisers on these mediums? *Given current market conditions, it should be noted that not all transactions are win-win. In financial markets, there are losers in trades. But when the trade was first put on the books and capital was put at risk, it was not intended to lose money for the firm. The exit of a trade at a loss is still desired by the losing party. And it should be noted that not every firm can negotiate a win-win. When running out of cash, a firm loses the power to capture most, or sometimes any, of the value created by a win-win partnership.